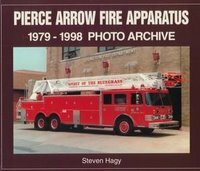 Pierce-Arrow Car Books includes volumes on the different Arrow series, the Pierce-Arrow history and more. Pierce-Arrow was an American automobile manufacturer founded by George N Pierce, based in Buffalo, New York, which was active from 1901-1938. Although best known for its expensive luxury cars, Pierce-Arrow also manufactured trucks, fire engines, motorcycles and bicycles. There Is No Mistaking A Pierce-Arrow by Brooks T Brierley (1979) is the story of the Pierce-Arrow automobile and the company that manufactured it, all set against the background of the times of which it was an important part: the turn of the century, World War 1, the Roaring Twenties and the Depression. The book also includes rarely seen photographs. Pierce-Arrow: First Among America's Finest by Maurice D Hendry (1971). A title in the famous Ballantine series produced during the 60's & 70's. This is a relatively scarce title in the car marque series. Illustrated history of the Pierce-Arrow automobile, one of the most famous American automobiles of the Jazz Age. Maurice Hendry has written many magazine articles on US automobile history. He belongs to the Pierce-Arrow Society, the Veteran and Vintage Car Club of New Zealand and owns a 1934 Pierce-Arrow. Advertisement For 1906 Pierce-Arrow Automobile (1906). This is an original advertisement for the 1906 Pierce-Arrow, including a list of dealers, in a 1906 issue of McClure's Magazine. These cars were the first official cars of the White House when two were ordered by President Taft in 1909 and were considered status symbols, being owned by John D Rockefeller, Babe Ruth, Tom Mix, Ginger Rogers and Ransom E Olds. The company ceased production in 1938 after selling five of its Silver Arrows for $10,000 each in 1933. The Great Arrow (1907) featuring a red and black Pierce-Arrow, filled with smartly dressed men and women, with an expansive golf course in the background. From a Harper's Weekly magazine. The History Of One Fine Car Through Its First 30 years. And Now the Finest of the Fine Cars of Today (1936). 12 page sales brochure folded accordian-style. One side gives a brief history of the Pierce-Arrow company, illustrated with pictures of the company's automobiles through the years. The other side is devoted to the company's then current models, with description and photographs of the Metropolitan Town Car, Five-Passenger Club Sedan, Enclosed Coupe, Convertible Coupe-Roadster and Five-Passenger Sedan. Pierce-Arrow 38 and 48 H.P. Models Dual Valves (c.1950) by Floyd Clymer. Reprint of a 1919 Pierce-Arrow catalog. The New Eight By Pierce-Arrow (1932) Loose-leaf sales portfolio containing 15 one-sided plates. 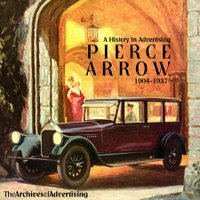 The Arrow: Series 64 - Models 1-3 (3 vols) (1964) features Pierce-Arrows in Australia and New Zealand, 1909 Pierce-Arrow specification sheets, two uses of Pierce-Arrow trucks, Taft's Pierce-Arrow, 1917 Tire Specification Changes, The Petiet/Pozzolo Collection. The Arrow: Series 80 - Model 2 (1980) features "A Pierce Arrow in the 1913 flood near Troy, NY. The Arrow: Series 81 - Model 2 (1981) features the 1921 Model 32 plus the Mysterious "Pierce-Arrow II". The Arrow: Series 82 - Model 2 (1982) features the Series 4 Pierce Arrows built between 1915-1918. Famous Old Cars by Hank Wieand Bowman (1957) Illustrated with black and white photographs. 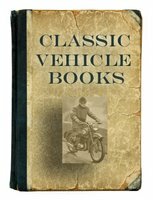 Includes Auburn, Cadillac and LaSalle; Chrysler; Cord; Duesenberg; Lincoln; Packard; Pierce-Arrow; American Classic Panorama: Cunningham; DuPont; Franklin; Jordan; Kissel; Locomobile; Marmon; Mercer; Ruxton; Stearns Knight; Stutz; Templar; and European Classics: Adler; Alfa Romeo; Bentley; Bugatti; Daimler; Delahaye; Hispano Suiza; Isotta Fraschini; Lagonda; Maybach; Mercedes Benz; Minerva; Renault; and Rolls Royce. Dim Thunder by William Campbell Gault (1958). Vintage auto racing with Reos, Nationals, Hupmobiles, Marmons and Pierce-Arrows. 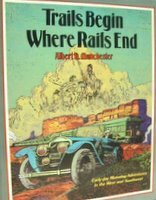 Trails Begin Where Rails End by Albert D Manchester (1987) heralds the hardy pioneers in locomobiles, Pierce-Arrows and Cadillacs who took to the sagebrush in search of what passed for roads, camped out and became the pioneer automobile tourists. San Sylmar: A Treasure House Of Functional Fine Art by Connie O'Kelley et al (1978) highlights the collections of the Nethercutt family with emphasis on classic & vintage automobiles. Includes 1914 American Underslung Touring car, 1921 Avions Voisin Sporting Victoria, 51 Bentley Coup de Ville, 35 Auburn Convertible, 1931-1940 Cadillacs, 1937 Cord Phaeton, 29 Daimler Touring Saloon, 1922 Duesenberg, 1912 Franklin Runabout, 33 Pierce-Arrow and much more. 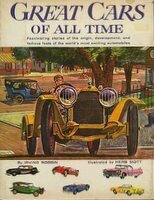 Great Cars Of All Time by Irving Robbin (1960) includes Cord, Pierce-Arrow, Stuts, Stanley Steamer, Packard, Railton Special and more. 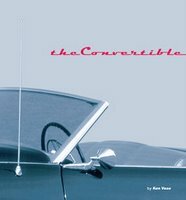 The Convertible: An Illustrated History Of A Dream Machine by Kenneth E Vose (1999) is a fascinating tribute to the glamour, style and allure of life with the top down. Includes classic Pierce-Arrows, Packards, Duesenbergs, Corvettes and many more. "With this witty history and lore are more than 125 photographs, illustrations, and other memorabilia - including rarely seen vintage photos and art created specifically for this volume."